Driving an all-new, redesigned 2012 Beetle around is akin to, say, walking your neighbor's Yorkie, or signing up for a ballet class. You are going to get attention from women. And they're going to think you are quite splendid and secure for being evolved enough to see the new Beetle for what it is: a sporty, attractive car that just happens to be a cultural icon (just like you! Erm, sort of. Moving on.). It has an available 200-hp Turbo engine, 18" alloy wheels, rear spoiler, sport interior trim, and LED headlights. The exterior is a sleek, aggresive new take on the iconic design. New interior tech features include an available panoramic tilt sunroof, touchscreen navigation, three colors of ambient interior lighting, and available Bluetooth technology. The stress of choosing a flower to put in the flower holder thingie is now gone, because the flower holder thingie itself is gone. So, be (more of) a man (than you already are). 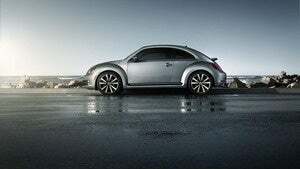 Check out the all-new redesigned 2012 VW Beetle.